This Sunday is the very well-organized, sold out cupcake event Cupcake Love-In in Phoenix, Arizona (they will have tickets available that day). You can get more info on their Facebook page and @cupcakelovein on Twitter. 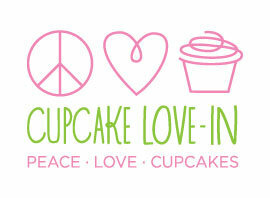 Peace, Love and Cupcakes. Sounds like a simple recipe for a sweet day. This was the idea behind the Cupcake Love-In from two Valley pastry chefs and event founders, Kelly Garcia of Butter & Me and Tracy Dempsey of Tracy Dempsey Originals. Amidst the abundance of annual culinary affairs, there was missing a celebration dedicated solely to desserts – specifically the beloved cupcake. Garcia and Dempsey envisioned such an event that would shine the light on the many talented and often overlooked bakers and pastry chefs that indulge our many sweet tooth’s every day. Equally important are the two local organizations chosen as beneficiaries of the day’s event – Singleton Moms and Safe Haven for Animals. These two wonderful charities demonstrate incredible compassion and tireless dedication to families in need and those furry members of our families who brighten each day. Honoring community and our amazing local businesses, the Cupcake Love-In celebrates the young and young at heart who savor the little things.